If you want a fun outdoor inflatable for Christmas then you should check out this Snoopy & Woodstock Christmas plane outdoor inflatable. Now you can have a 12 x 5.64 feet plane that has lights in it and blows itself up in no time at all. 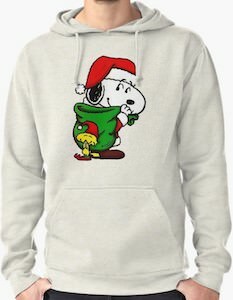 The plane is green and red and in the plane you find Snoopy and behind him we find his bird friend Woodstock and the bird is wearing a red Christmas hat and yes there is red ribbon to to make it feel festive. 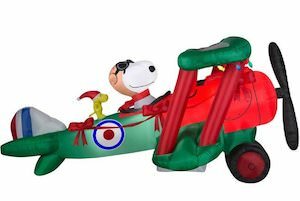 This time Snoopy is not try to fight the Red Baron as he is to busy bringing the Christmas spirit to everyone that walks besides it when it is inflated in your garden. If you like some cool Vans sneakers and you like classic comics then you have to check out these Peanuts shoes. 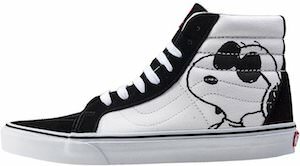 These sneakers are black and white and on the white side panel you can find Snoopy on one side and on the other side it has Woodstock so now you can walk around with your favorite Peanuts character just looking cool too. These high sneakers are available in many sizes for both men and women so that everyone that is cool can look amazing especially as Snoopy and Woodstock wear cool dark glasses too. So now you can have cool Vans shoes and you favorite Peanuts characters on your feet and that is just what everyone needs. If you want a special Valentine’s gift for a Peanuts fan then this Snoopy and Woodstock mug is what you need. 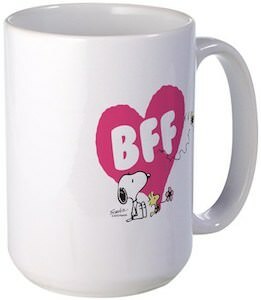 The white mug shows Snoopy and Woodstock sitting down while looking at a butterfly flying by and behind all that it shows a big heart within it the letters “BFF” and we all know that this means “Best Friends Forever”. So if you want to surprise your BFF then why not with a special mug they can use for morning coffee, afternoon tea, and even a strong drink if needed. The Peanuts mug is made from ceramic and can hold up to 15oz of your favorite drink and it is dishwasher and microwave safe. Ice cubes are often just boring in shape but if you like the Peanuts cartoons then this could be a thing of the past. This red ice cube tray will make Snoopy and Woodstock ice cubes and that is so much more fun then those boring squares. Made from flexible silicone this Peanuts ice cube tray is super easy to use and more importantly the ice cubes are really easy to get out. And besides plain water you could choose to add some color to your ice cubes to make it extra fun to see them melt in you drink. 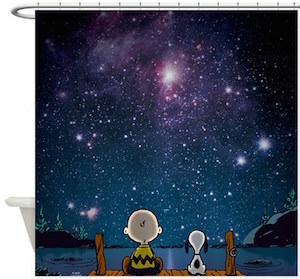 The lovable characters from The Peanuts Gang are so fun. 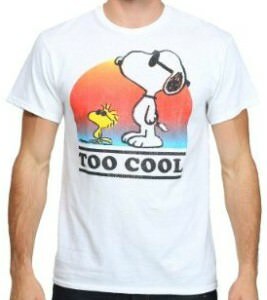 If you love Snoopy the little white dog and the Woodstock the little yellow bird then have a look at this t-shirt. 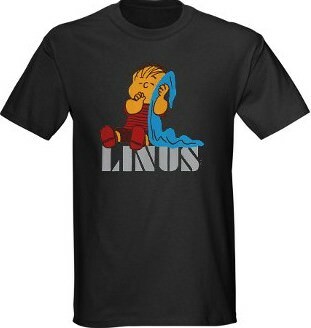 On the front of this t-shirt you see two fun Peanuts characters of Snoopy and Woodstock. Both Snoopy and Woodstock have sunglasses on with a nice sunset color behind them. Along with the sketch image there is also the text saying of “Too Cool”. Available in a wide selection of men’s fitted sizes that will range from Small to 2XL. Made from 100% cotton to give you a soft comfortable shirt that will also be very durable and last a long time. Get your Peanuts Gang stocking holder for Christmas and of course Snoopy and Woodstock are involved in the holiday season. This stocking holder features a very fun scene using two Peanuts characters. Find Snoopy the white adorable dog sitting in snow and wearing a Santa hat aswell as a red and green striped scarf. 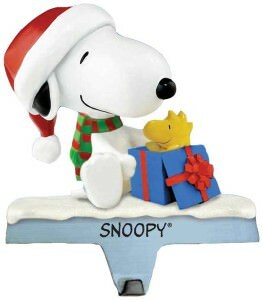 Snoopy is opening a present and with the lid off look at who is in the present, it is Woodstock along with the name of “Snoopy” on the stocking holder. Made of durable resin that is painted with vibrant colors to look amazing, it is easy to set up and easy to hang your Christmas stocking on. The Peanuts are back again in the form of a lunchbox. 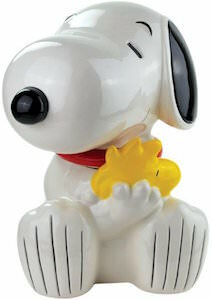 Your little ones will love having Snoopy and Woodstock accompany them everyday for lunch. This Peanuts lunchbox is a rectangular tin box. It has a red outline on a blue background with many joyful graphics of Snoopy and Woodstock. 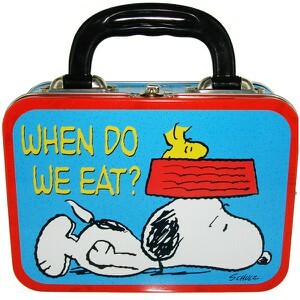 One side of the lunchbox has Snoopy lying down on his belly with his food dish balancing on his head. Woodstock is sitting in his food dish, and it says, “When Do We Eat?”. On the other side of the lunchbox, Snoopy is standing up with his food dish in his mouth and Woodstock is standing in it. It says, “I’m very patient, it’s my stomach that’s crabby”. So great! This lunchbox measures approximately 7.25 inches by 5.25 inches by 3 inches. It comes with a hard durable plastic handle and a tight metal clasps.